In part 1 Neil laid out the challenges of managing the installation of Pro Tools software so that Macs on a network can install it automatically. A Mac for testing your installation on before you put it into production is recommended. First, import the Pro Tools Installer DMG as-is into Munki. This gets the application itself in a deployable state. Now mount the DMG and import any additional installer packages you need into Munki as well. In my example, I have the HD Driver. Finally, unzip and import the iLok License Manager DMG into Munki. Now we need to edit the pkginfos for Pro Tools and the HD Drivers installer. These define how each piece of software is handled by Munki when clients install them. 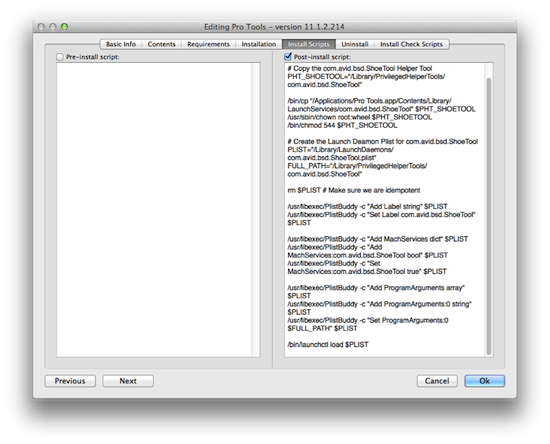 For the Pro Tools application we will add a script that runs after the application bundle has been installed on a client. It will copy the ShoeTool from the application bundle to its rightful place and create the correct Launch Daemon property list for it so that Pro Tools doesn’t have to. Thanks to Ricky Chilcott from the Macenterprise mailing list for the original version of this script which I have slightly modified to reflect the name change from DigiShoeTool to ShoeTool in the most current version of Pro Tools. Note for people not using Munki – you will need to create an installer package containing the Pro Tools application with that post-install script instead, if your software management system doesn’t support importing DMG files directly. I won’t go into the details but once you see what I had to do to the AIR Creative Collection in the next chapter, you’ll probably get a rough idea of how to do it. I don’t know if this happens with the codecs installer, as I don’t need it. So what have we got now? Pro Tools is inside our Munki repository, ready for your client machines to grab and install. Add them to the required manifests and watch the magic happen, or go to the pub. You’ve earned that pint! In part 3 we’ll deal with the AIR Creative Collection DMG in a rather creative way.